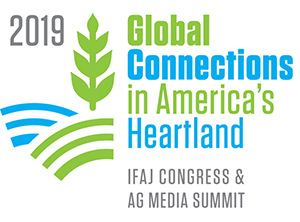 Ethanol is now the fuel of choice in Brazil, while gasoline is the alternative, and one advocate believes that with one simple law passed by Congress the same thing could happen in the United States. According to Dr. Robert Zubrin, author of “Energy Victory,” who was the keynote speaker at the opening session of the 2008 Fuel Ethanol Workshop Tuesday in Nashville, mandating that all new vehicles sold in the U.S. be flex fuel would effectively break the economic stranglehold the oil cartel has on the country and the world. That’s because right now there is mainly one way to power vehicles and that is petroleum products. The key is to change that trump suit, he says, and biomass is the best alternative. The question is how to change the trump suit and Zubrin contends that the answer is to mandate the sale of flex fuel vehicles, which would cost at most $100 per vehicle. “If we had a standard that all new cars sold in this country had to be flex fuel, within three years we’d have 50 million cars on the road in the United States capable of running on alternate fuels,” and Zubrin says that would ultimately result in flex fuel vehicles being sold all over the world. 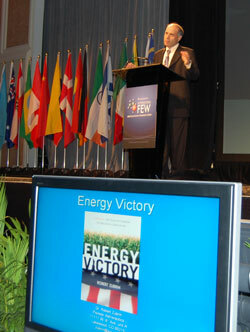 To find out more about Zubrin’s book “Energy Victory,” go to energyvictory.net.